Canberra has a problem like no other city: “mobs” of urban kangaroos are coming down from the dry hills at night to eat watered lawns and gardens. In Kangaroo Mob Nature looks at the territorial government’s huge study into how kangaroos move through the city and suburbs. Turns out, they’re smart enough to avoid highways and take underpasses–but they still get hit by cars in great numbers. Some love seeing them, others fear they are taking over. Best line in the show: “It’s like most stories of kangaroo attack stories, critical elements have got left out,” the researcher Don Fletcher says, debunking some anti-kangaroo hysteria. What’s fascinating is what it says about how we universal the drama of an overgrown native species is. It’s nearly identical to our deer issue. Suburbs ate the animals’ habitat and now the animals are eating the suburbs. 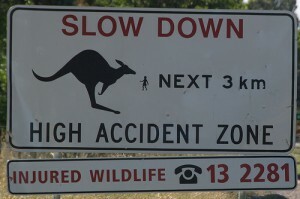 The population is only checked by car accidents because hunters wiped out their only predators–in Australia, dingos. The once rare creatures have grown into a nuisance. Officials started shooting them in the name of saving the environment. Animal tourists protested. In Canberra they wear adorable kangaroo masks and costumes and in one case a baby in a Bjorn. The government started working on contraceptives. Maybe we humans are just destined to play out this drama. The only character missing is the American hunter who yells about why we really need to shoot all these horrible deer/kangaroo–while quietly pushing to keep up their numbers so there will be more shooting fun.